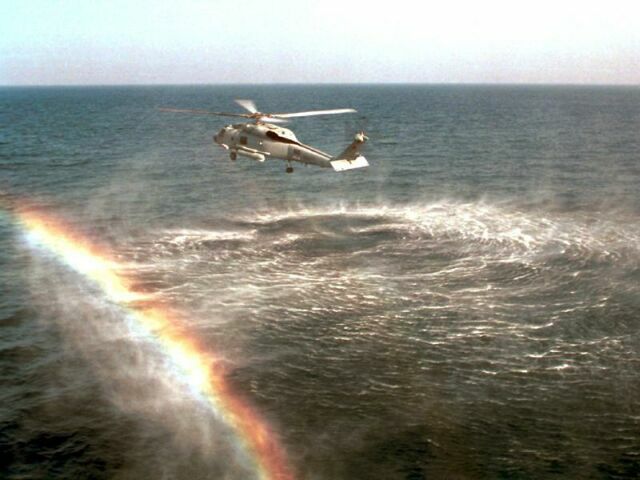 The Arabian Gulf, 25 July 2000  An SH-60 Seahawk of the "Red Lions"  Helicopter Anti-Submarine Squadron One Five (HS-15)  creates a rainbow by its rotor wash as it conducts anti-submarine warfare (ASW) training in the Arabian Gulf. The squadron is part of the USS George Washington (CVN 73) air wing. George Washington is operating in the Arabian Gulf in support of Operation Southern Watch.